Amazing Follower Tweaks - Spanish Sobreescribe el .esp del original por el de la traducción. Feel free to extract code snippets from AFT and use them in your own mod. While credit is always appreciated, you don't need to credit to Dheuster if you only use a few scripts. So where is the line? If your derived work uses 51% or more of AFT's code base, then standard open source rules apply: Credit is required, keep it free and give others the same permission to modify YOUR work. Translations, Tweaks and GUI overhauls all fall into this later category. All credit goes to Dhuester who is the creator of this mod and JFKRoger for his work with SE conversion and AFT plugins. Here is the link to the original nexus mod page: http://www.nexusmods.com/skyrim/mods/15524/? The default Bonus Outfit is a nocturnal model fix/retexture that I previously did. For the most part it is property of Bethesda. First off, all credit goes to Dhuester who is the creator of this mod. I am only the one who ported it. As par of Dhuester's open source rules listed under permissions, since this mod contains more than 51% of AFT's code base, see credit section's below to view pasted permissions from Dhuester, it is of course free, and anyone has permission to modify this rendition of Amazing Follower Tweaks for Skyrim Special Edition as long as you follow Dhuester's open source rules as well. if you only use a few scripts. overhauls all fall into this later category." 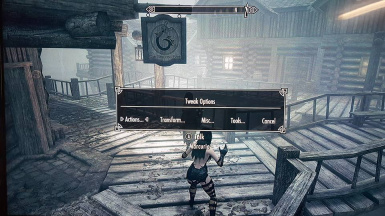 It is a modified rendition of Amazing Follower Tweaks by Dhuester for Skyrim Special Edition. relax, auto change into standard/city/home outfit. Auto toggle helmets. How do I use the mod? When the mod is first loaded into the game, 2 spells will appear in your magic selection. They will let you access features of this mod remotely. To, for example, summon all followers (in case they get lost), transform all werewolf/vampire lord followers, access AFT settings, etc. To access AFT for followers, simply talk to them and select the dialogue option 'Tweaks'. Max followers: You can have a max of 5 followers at one time, I have not tested beyond that yet. Additionally, there is an option in AFT settings to limit it to 3 followers if you choose to. weapons, forgive friendly fire. And all of this is optional of coarse. follower automatically equips the pre-configured outfits. Feel free to create your outfit out of your favorite custom mod items. appropriate option from the magic menu. DragonBorn DLC and Dawnguard DLC spells supported. Handy for keeping all your followers in one location (like your house). - Turn followers into werewolves! become a vampire and gain the expected resistances and spells. in the face and can transform into Vampire Lord form. combination of their weapon and spells. specify where every last stat and skill point goes. It is your call. bonuses even beyond their level cap. followers to transform into their Beast forms. Have followers strike a pose or dance and then have them stay that way. A fun way to add ambience to your camp or house. A power that makes all followers invisible and muffled until YOU get caught. Great for assassination missions. For people that don't like reloading. Following the player across skyrim's treacherous terrain can be difficult. Luckly, followers will catch up to you anytime you draw your weapon. Handy when you find yourself surrounded by enemies. A boon for vampires who can use followers as a travelling happy meal. - Option: Beast form followers ignored just like summoned creatures. sight if you have werewolf or Vampire Lord followers. It is amazing how much immersion it adds to see your followers mount up. See readme for restrictions. Get through 2 whole quests before needing to visit a merchant. Save time when you have 5 followers sporting 5000 lbs of inventory. Nice when combined with Item de-duplication. Prevent them from attacking people when you are trying to sneak around. Prevent them from running from combat. Ever get tired of a follower refusing to do something you tell them to? Well, this mod makes sure that doesn't happen. Illia, Aranea, Eola, Ugor, and Lydia by popular request. Also Erik the Slayer, Golldir, Ahtar. What can I say. The bow on the back is irritating. A custom outfit you can have any follower put on. Outfit packs coming soon. This mod isn't compatible with mods that alter the follower limit, and may have some issues with eye textures for certain custom race mods. 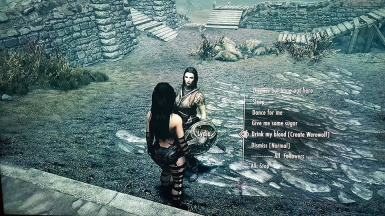 Is this mod compatible with custom follower mods? It should be, but that isn't a guarantee. Can't you make the max follower limit more than 5? I could, but it would be very extensive and I have a family to take care of. 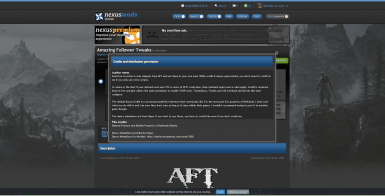 If you enjoy this mod, please endorse and give props to the original Nexus page. ***For any additional inquires, please direct your questions to to the comment section. If you comment and ask a question, please be prepared to wait a little while for feedback. I mainly spend most of my time monitoring Bethesda because that is where all of the other mods I have uploaded are (because I prefer Bethesda over Nexus). Additionally, I have a family and a little girl to spend time with and am responsible for, I can't spend every moment of every day monitoring every comment section of all of the mods I have downloaded. That being said, if you ask a question please be patient.